What does it promise? Ultra-fine yet rich colour glides on smoothly to create natural-looking definition as close to the lashline as possible. A precise tip every time–no sharpening required. Ophthalmologist Tested. Allergy Tested. 100% Fragrance Free. Does it deliver? 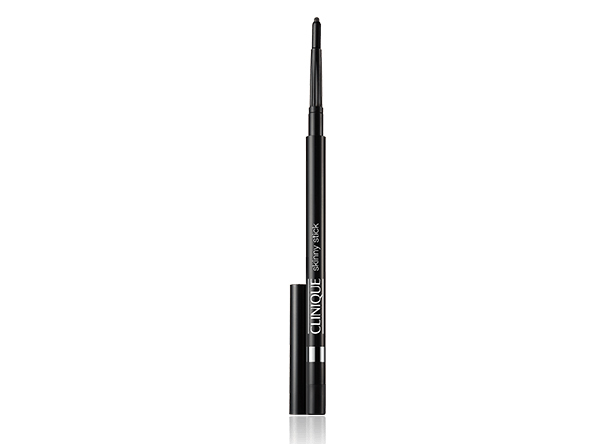 If you’re looking for an eyeliner that just adds a bit of definition to your lash line, then this is for you. One quick flick with this adds volume to your lashes, so they look naturally thick. Plus it hugs super close to your lash line, so you don’t end up with any mistakes. I did have a bit of trouble getting the formula to glide at the start, but this seemed to be just teething problems because after a few strokes it was dreamy. But, if you’re aiming to do a full-on retro cat-eye flick, then consider their Clinique Pretty Easy Liquid Eyelining Pen instead. It will take less time to build up the dramatic effect you’re after.